Black Mirror is one of the most unsettling shows on television right now. For every episode like the beautiful, heartwarming “San Junipero,” there are eight that will keep you up at night in fear of technology and its power over us. Fun, right? Lucky for us, Netflix just released a new trailer for Black Mirror Season 4. It’s for an upcoming episode called “Arkangel.” And the episode is directed by Jodie Foster, so you know it’s gonna be gooood. “Arkangel” stars Rosemarie DeWitt (La La Land) as a mom who loses track of her young daughter on the playground. Immediately, she freaks out. Though her daughter is found quickly, she decides something needs to change. The solution? Implanting a tracking device in her daughter’s brain. Yeah, this is going to go well. 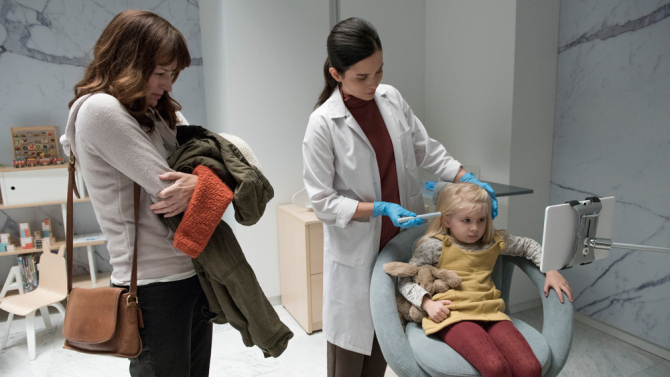 The trailer poses the idea that “the key to good parenting is control.” This plot arc, like so many Black Mirror episodes, doesn’t sound too far off from how we live now. These days, parents often use cell phones as tracking devices. Gone are the old days of running around the neighborhood unsupervised. Parents want to keep track of every move their kids make. The implant, though it seems extreme in the episode, is an extension of those tendencies. Here’s the trailer for the “Arkangel” episode of Black Mirror. We’ll start preparing ourselves now for another chilling season. 'Tone wise, [the episode is] almost within the world of an indie drama — and you could say that’s classic Black Mirror," showrunner Charlie Brooker told Entertainment Weekly. "It’s about a mother and a daughter and a technological opportunity that comes along that’s seized upon." Um, how creepy is the tagline “mother will protect you”? Answer: extremely. As of now, Netflix has not announced a release date for Season 4 of Black Mirror. So this trailer will have to tide us over. In the meantime, enjoy reading this on your tracking device!